Rose Hill offers the best of Southport Village living! 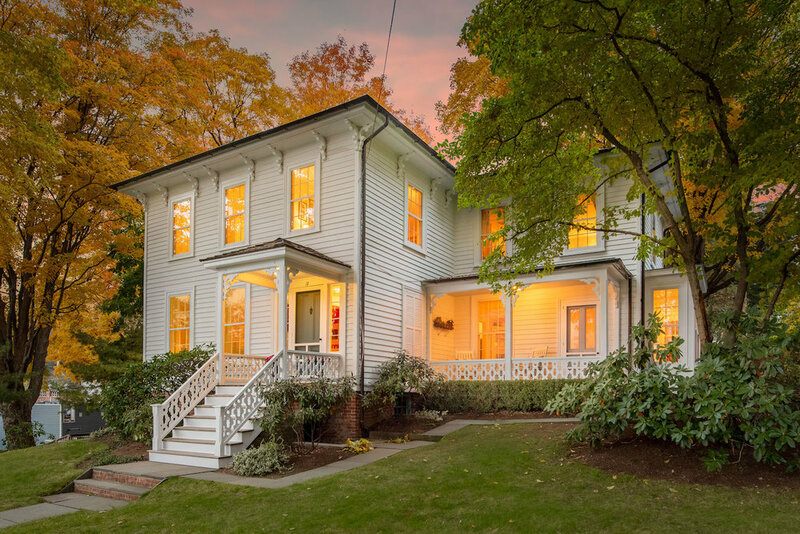 This gracious 1856 home, built by a prominent Southport sea captain in the Italianate style, is steps from all village amenities (shops, restaurants, pubs, Pequot Library and Metro North) and the incomparable beauty of Southport Harbor. Well-maintained .41-acre property with mature maples, old stone walls, and lovely, level backyard. Cedar shake roof, copper gutters, wide plank flooring, arched doorways and other stunning 19th century details. Wonderful ground-floor plan yields to double outdoor patios for easy al fresco dining and entertaining. Large original windows and 9-foot ceilings draw natural light into each room. LR and FR both have working fireplaces. Mudroom/Kitchen with new stainless appliances and butcher block counters leads to elegant DR with boxed window and access to charming front porch with views of the sunset over the village. Beautiful second floor landing with custom floor-to-ceiling bookcases. All bedrooms have multiple windows and amazing light. Master with en-suite bath. Finished basement with exposed brick walls and fireplace could be used as an additional bedroom or home office. Golf, sailing, beach, the most beautiful walks anywhere—it's all here. This home is the epitome of storybook charm and comfort. Make it your own.